The great Orange March in Edinburgh will be the only occasion on which the No side have managed to gather more than 300 people in one place in the entire campaign. 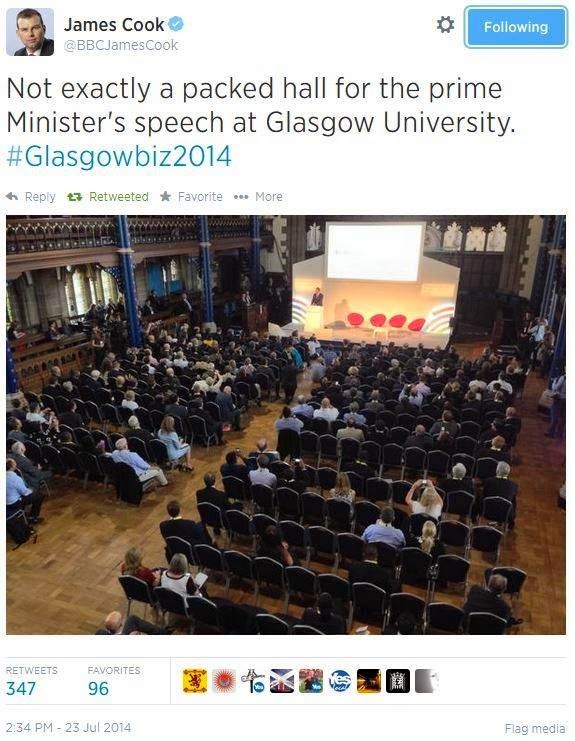 The average turnout for David Cameron’s big speeches of the campaign in Glasgow and Perth was under 200 people. On my own recent speaking tour we substantially beat that in Dundee and equalled it in the small town of Insch! Not to mention the 70,000 people who have watched my St Andrews speech online. Gordon Brown’s speaking tours have been strictly ticket only – and a fair number of the invited have declined the opportunity. Search online as much as you like. There are no substantial No gatherings of any kind, no No flash mobs or mass canvasses. There is no speech for the No campaign that has a fifth of 70,000 views online. But they do have the Orange Order and their grand March in Edinburgh on the 13 September. This parade of knuckle dragging Neanderthals, many of them off the ferry from Northern Ireland, is the only show of popular enthusiasm for the Union ever to be mustered by Better Together. Unfortunately it is illegal. As I posted on 11 August, this proposed Orange March is plainly in contravention of the Public Order Act 1936, which bans any demonstrations in uniform for a political object. Normally, the Orange Order in Scotland are allowed to march on the (dubious) grounds that their object is cultural not political. But on this occasion they are marching as a registered participant with the Electoral Commission in the Referendum campaign, and with the avowed object of promoting a No vote. There is therefore no doubt whatsoever that the march is political and, if in uniform, illegal. Orange Order sources confirm they will be marching in uniform. Thank you for your email. Following a search of our records I can advise that the Scottish Government has neither received nor granted an application from Police Scotland under the Public Order Act 1936 to permit the wearing of political uniforms by members of the Orange Order. As I stated in my previous email, I am unable to provide legal advice interpreting whether or not the Act applies in this situation. The real question is whether the law is applied impartially to all, or are those who have the support of the Establishment allowed to break the law flagrantly and massively? Can’t believe all you so called anti establishment, anti fascists, are running to the law (who you despise ) trying your hardest to deny freedom of speech and the right to assembly. Guess what the parade isn’t illegal so fire away and make yourselves out to be bigger clowns than what you already are.